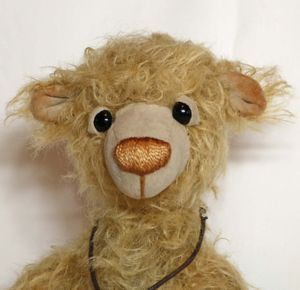 Finnigan is made from a curly matted gold mohair with an inset mini fabric nose.He stands 11" tall. Finnigan's eyes are black glass with mini fabric sleepy eyelids. His nose is gold perle cotton with shading. He has beige unltra suede on his paws and foot pads with pulled toes and shading. 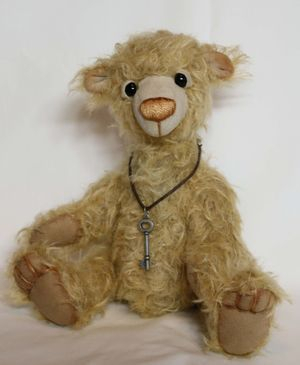 Finnigan has a key to his heart around his neck. He is 5 way jointed and stuffed with Poly-fil. Click on the down arrow for the shipping cost to where you live. Thanks.